An expansion of the Los Angeles County Museum of Art might include a bridge over Wilshire Boulevard to a new structure on both the north and south side of the street — the south side to be built on the museum’s parking lot. 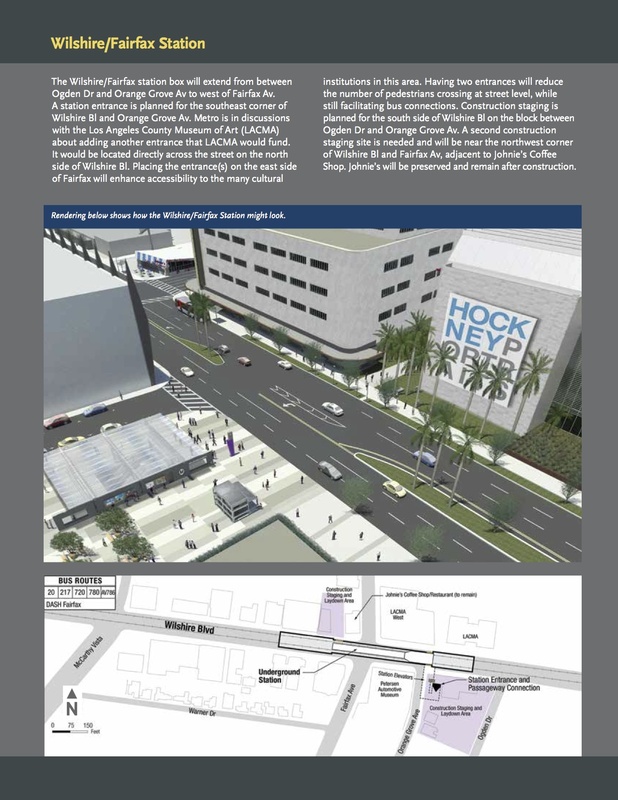 If it gets approved, funded and built, the new building would be a couple of blocks east of the entrance to the Wilshire/Fairfax Purple Line station that will be located at Wilshire and Orange Grove. After several months of gnawing twin tunnels beneath San Francisco’s densest districts, tunnel-boring machines Big Alma and Mom Chung have arrived at the former home of thePagoda Palace Theater in North Beach. They’ll be dismembered at the bottom of a giant pit and then yanked, piece by piece, from the ground and hauled away. It’s an unceremonious end to a big dig – excavating and building 8,300 linear feet of concrete-lined tunnels running from South of Market beneath Union Square and Chinatown to North Beach. But the excavation passed unnoticed by people on the surface, who didn’t even feel vibrations. Big Alma and Mom Chung, each weighing 750 tons and stretching longer than a football field, even passed 7 feet beneath the BART tracks below Market Street without requiring the transit system to stop, or even slow, its trains. “Isn’t it amazing that we can build a tunnel underneath the most congested part of San Francisco without making the front page of The Chronicle?” said John Funghi, project manager for the subway. There’s a ton of work to be done, including station construction, the laying of tracks and the installation of sophisticated electronic systems. Test trains are scheduled to be up and running in 2018 with an opening of the new subway in 2019. A very cool new survey by our compadres at Foothill Transit, which provides bus service across the San Gabriel Valley. The survey allows users to pick amenities that they would like to see the agency add — and keeps score of associated costs so that people can’t just pick everything under the sun. Very cool. Imagine that you snag a parking spot on a busy downtown street where finding a slot is generally the equivalent of winning the lottery. Once your car is in the spot, Dorsey says, the app allows you to “sell” that space to the highest bidder. The winner gets to slide their car in as yours pulls out, paying you perhaps $25 in addition to the actual meter fees. The problem is that those parking spaces, unlike driveways, are clearly public assets that private citizens are forbidden to sell. There are really people stupid enough to spend $25 plus the cost of a meter for a parking space? Its too bad many of the stations don’t have portals on both sides of the streets at the new stops. Pershing square station is a great example of portals that feed a few areas and reduce street crossings at some points. > for a parking space? Evidently, given that there are people stupid enough to drive in downtown San Francisco, rather than take the MUNI, and stupid enough to pay the one-way cable car fare, rather than buying a MUNI pass (which, for a one-day pass, pays for itself on the 3rd cable car ride, the 8th bus/trolley cash fare, or any equivalent combination, and for 3 and 7 day passes is an even better deal). Then again, back home, twice in less than a month, I was stupid enough to (out of force of habit) buy a Metro day pass for a trip that only involved 2 boardings. (And yes, locals really do ride the cable cars. Not so much during prime tourist hours, but I’ve been on the Mason car at times when monthly FastPasses easily outnumbered cash fares, 1-day passes, 3-day passes, and 7-day passes combined). Duh. It’s called supply and demand. If there is a short supply on something in which demand is high, then prices rise. It’s Econ 101 and it’s the first thing you learn there. Why is it that people are willing to pay $25 plus the cost of the meter for a parking space? Supply and demand. The comment of simply stating that there are “people stupid enough to spend $25 plus the cost of a meter” only shows government incompetence that it is incapable of analyzing things from an academic perspective. If they took the time understand and took simple basic college classes, they would realize that this is a great example of supply and demand in action and they will act accordingly to maximize how to increase government revenues. When the municipal governments hear about this going on, they should realize that parking is a valuable commodity, especially in the heart of a densely populated urban areas. Municipal governments need to realize how much money they are losing to simple above ground flat surface public parking spaces and how much extra money they can gain if they did some investments. The article has show that the simple economics, basic supply and demand in action that yes, there are people who are willing to pay $25 plus the cost of the meter for the privilege of parking at a valuable space in Downtown. There are 4.5 million people living in SF County, not everyone is going to think like you do. You may think it’s stupid. For a lawyer who makes six digit incomes or a IT entrepreneur who makes billions, $25 is nothing. Or perhaps it’s a family of four from out of state visiting what SF has to offer. Split between a family of four, $25 is still $6.25 per person. A family of four from out of state who wants to visit Fishermans’ Wharf would likely be willing to pay $25 for the premium of parking right there than locals who’d go there by MUNI. It’s more “stupid” that government agencies aren’t jumping onto this. If they were smart, they would see how much people are willing to spend on parking in the most hottest go-to places, and would spend taxpayer investment in car parking systems, elevators, and even garage carousels (do your own Google search what these are, it’s used in many densely populated cities from NYC, Tokyo, and Taipei where parking is a premium due to lack of space) to maximize car parking space in a limited land size, and the municipal governments can bring in more long term revenues by a premium for doing so. 8300 Tunnels?!?!? Wow, SF must be completely undermined! Maybe 8,300 feet of tunels. One thing for sure is that if public parking fees were $25 at prime locations and there are people that are willing to pay such a premium for it, the money earned would go a long way to help create additional revenues to fund public transit. It’s just like the lottery. Stupid people who play the lotto help fund our education system (not that it’s helping because despite all the idiots who dream of winning big, CA’s schools ranks the lowest among the nation these days), stupid people who pay for parking help fund our transit system. Yes, and stupid people paying $6 for a one-way joyride on a cable car are most likely the reason why I can pay $29 and have the run of the MUNI (INCLUDING cable cars!) for an entire week. Speaking of the MUNI, and cable cars: there’s an “island stop” on the NB side of Powell, at the NW corner of Union Square. I’ve heard it called “Fantasy Island.” Because it’s only 4 blocks up from the Hallidie Plaza Turntable (only a fifth of a mile), and if you think you’re actually going to catch a cable car there during prime tourist hours (when the line at the turntable is a block long, the cars are departing packed, and nobody in his right mind would be getting off a NB car at Union Square), . . . .
San Francisco operates in a totally different universe than anywhere else. While visiting there once I was channel surfing in my hotel room and came upon a City Agency Hearing. It seems that if you want to build a house on a street where the current houses have no parking you can’t build your house with parking. Not everyone is going to be in SF for an entire week, not everyone travels alone. Majority of Americans are not single and do not travel alone. They have families and children of their own. They have restricted vacation days. They have family budgets. That’s how they think. When Metro opted for the Orange Grove location for the Wilshire/Fairfax stop instead of the space next to Johnnie’s, wasn’t there some talk of LACMA, through private fundraising efforts, financing a station entrance inside the May Co building? What is the latest with that?